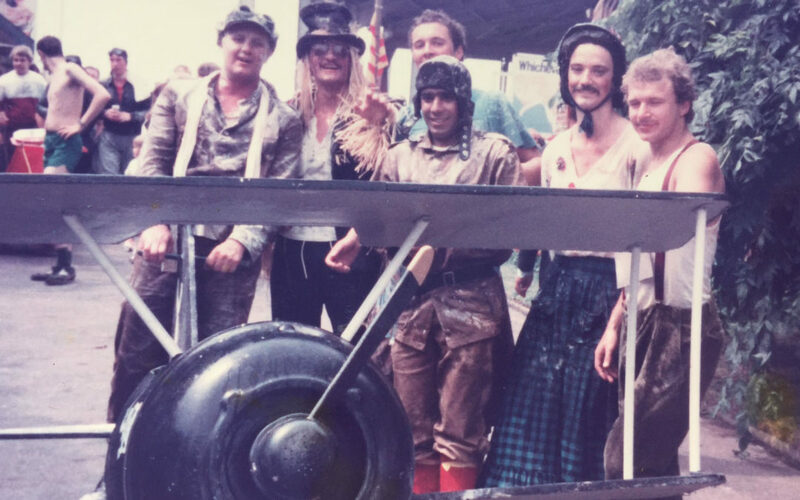 Local journalist and historian Colin Grainger recalls some of the many Forgotten Stories from Ferry Festival events of the past. It means so much to everyone, even though it is one of the most recent of our stories. It is the community’s way of showing that an incredible spirit exists in our special place. It’s our way of – politely – sticking two fingers up to anyone who dares to suggest the soul of our community is lost. The event really captured the joy of the ‘good old days’ on our manor. In the early 1970s the Royal Docks area was finding it hard. The closures of the docks and many local factories changed the community – and also relationships within families. There was resentment that national and local governments weren’t doing enough for our area. But against this backdrop, the fightback began…in the most unusual of ways. Locals decided they needed a fillip for the community. The idea was mentioned of having a local festival. One member of the first group that got together was Fred Bowyer, who sadly died a few weeks ago aged 80. Speaking 14 years ago, Fred said he and a friend Mickey Rutter, had seen a short video from friends in Poplar who had staged a community event. It then got mentioned over drinks in the Henley Arms, North Woolwich. Jobs were divided up and events created. Nick Nicholls from St John’s Church, was drafted in. Still Fred insisted he did not want to officially be on the committee. “I’ll run the beer tent,” he said. A tug-of war contest was proposed, as well as rides for the children. Then, the first master stroke. A Superpub competition was launched between the 13 pubs in the area, involving darts, pool and cribbage. It got hundreds of people involved every week. “This went on from February or March” said Fred. “People were out every night, enjoying each other’s company again”. Football and cricket competitions were also staged. Two more masterstrokes created massive interest – a procession around the streets, followed by a pram race between all the pubs. The procession involved groups of people from all ages and groups. As the years went by, the floats got more and more interesting. Firms, pubs, clubs, and associations all had their own themes. 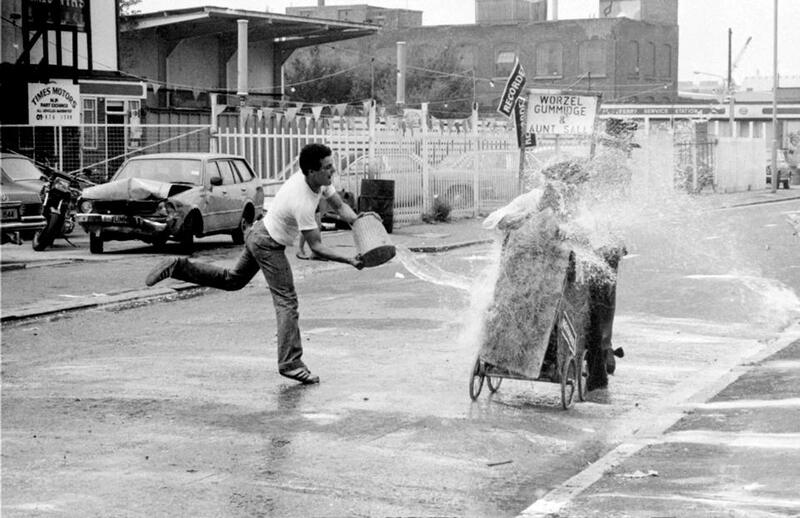 Very often the walk around the streets was a survival battle as some tried a friendly sabotage of your pram for the forthcoming race! 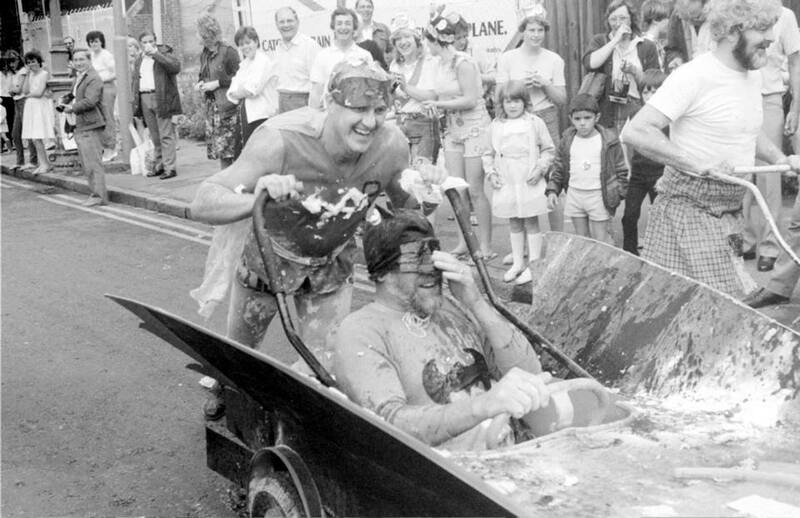 Then there was the flan thrower – the pie of shaving foam shoved in your face by the ‘phantom’. I got involved the first year as a reporter, but also as a local lad who had lived in the area for many years. Each year, my paper, the Newham Recorder, entered more teams and devoted more space to coverage of the event. Where the Newham Town Show was an excellent event in its own right, this was fun, organised mayhem, and so important to everyone. So much work was done by so many people behind the scenes to make it happen. I was there to cover the event as well as take part, but also back in the bosom of the community I had left a few years earlier. Most of my family ran, worked in or drank in the local pubs. It seemed that every year (bar one) the day arrived, the weather was beautiful. And even when the heavens opened, it did not stop the fun. The late Fred Bowyer recalls: “There was a parade with a marching band. The old bill had stopped all the traffic. We said we thought about 400 people would turn up, but there were thousands, some estimated about 10,000 during the whole day. “Then came the first problem. We ran out of beer. It was getting frustrating. A guy I used to be in the Forces with, called Roger Smith, turned up. He was a police Chief Inspector. He asked what the problem was. I had run out of glasses as well. Fred and his volunteers collected glasses and begged and borrowed canned beer from the pubs – which were open themselves all day – long before the days of all day opening. “The local lads went around in their cars bringing stocks,” he remembers. Every pram race brought smiles to the faces of the community and rekindled old rivalries among the racers. A committee graph recovered recently showed a host of names: Nick Nicolls became chairman, Maureen Bowyer secretary, Joan King treasurer, Anne Batchelor decorations, Jim Bigland stalls, Alec James planning, Richard James and Edna Abbott events, Fred – the beer, Sports Mike Harvey. Refreshments Eileen Tyte and Elsie Marchant, Eileen Norton Eileen Sullivan, events for pensioners. Fred mentioned Paul Conroy, Chrissy Abbott, David Conroy and Maureen Hayward as stalwarts. 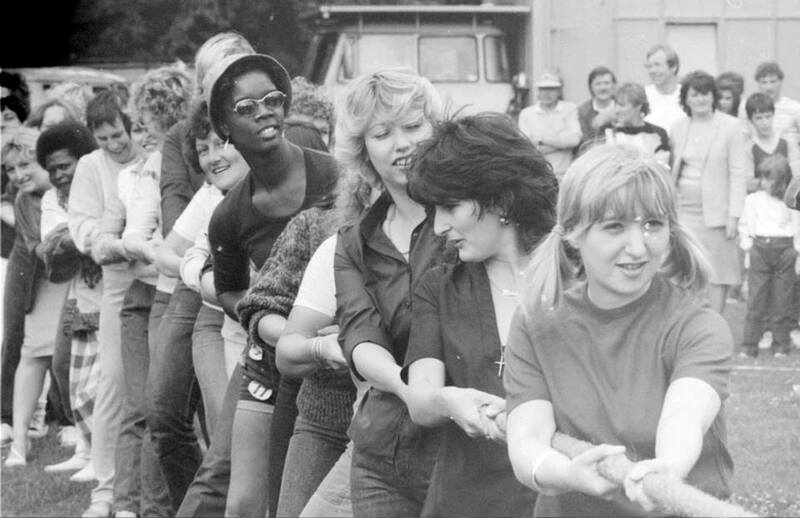 The first festival was held in July 1974 and was organised by the North Woolwich Tenants Association. 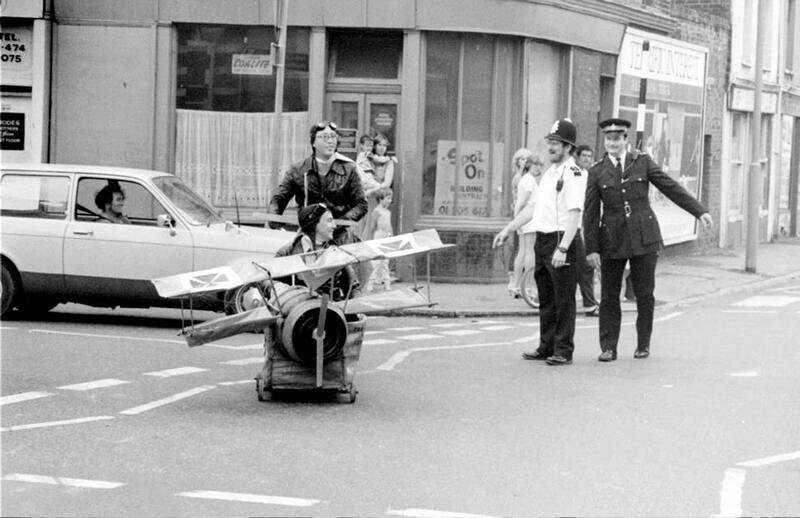 Following the procession around the streets, and the pram race, the fun began in earnest. There were stalls, funfair rides, games and a beer tent. There were displays and competitions throughout the day: fancy dress, baby show, children’s races, karate displays, five-a-side football and tug-of-war. Later in the day, there were bands and a disco, before the evening finished off with a firework display. Some of the streets held their own parties. Local Studies Library mounted displays about the history of the area. Everyone has their own special memory. The pram race saw participants go around local pubs and drink beer at each one. The contestants, two to a pram, had to be in fancy dress and some carried flour bombs and eggs as ammunition to throw at passers by. There were prizes for the best-dressed pram and the fastest pram. The race started at the park and then up to the Royal Pavilion and then across the road to the Three Crowns. It was a sprint along Albert Road down to the Royal Albert, then a turn back to Kennard St. Community Centre, The Henley and another long sprint back up Albert Road to the Royal Standard. Next was along Pier Road, into Woodman Street and the Royal Oak, down the road and round the corner to the California, up to the Round House then to Woolwich Manor Way, through the park and back to the finish at the starting line. Ten stops and many laughs. We dressed up every year in everything from Wee Willy Winkie and Little Miss Muffet to builders, journalists and painters. I had the honour of winning one year. One year my pal Andy Fairbairn and I dressed up as Worzel Gummidge and Aunt Sally. He liked women’s clothing (don’t ask), so I was Worzel. Locals loved how the Recorder supported the event and everyone loved it. 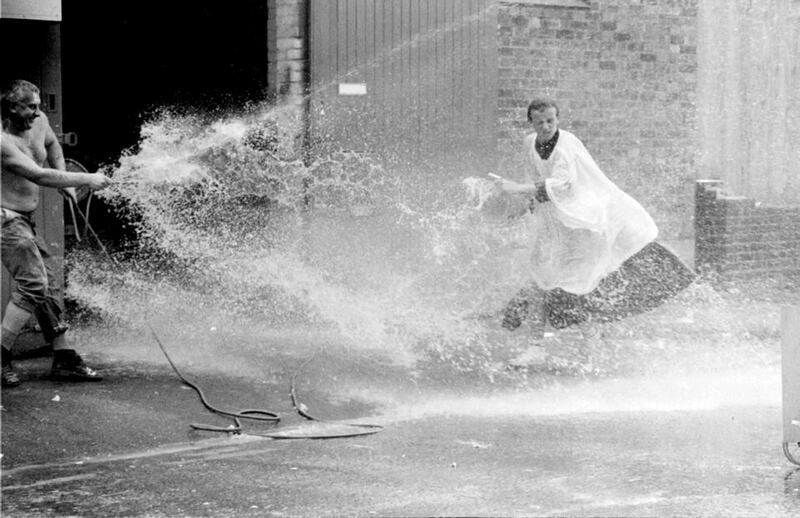 We never won another title as we used to get hosed by garage workers with industrial hoses if we got anywhere near the finish line, before the locals! I’m proud to say we were immortalised by a mural in St John’s church in our costumes. Former home beat officer PC Alan Godfrey was a stalwart of the festival for many years. Now 78, he recalls the festival with great pleasure. “Some said they had been in training by raising a glass to drink a pint every night but looking at their stomachs knew they would pass out”. Alan revealed how they picked the volunteer in the programme for the 1983 event. Alan made the trip, went up in the lift and found, to his delight, a suitable old pram. “This was about to be turned into The Fuzz Wagon. But when I got to the ground floor, I did not have the courage to walk back to the nick in uniform pushing a pram. The local kids would have had a field day. I tried to call up on my radio for a police van to come and meet me at the block of flats, but because of steel work around the flats, my radio did not work. When the Rev Chris Sheldrake moved into the area, he became a great supporter of the event. Locals appreciated his energy and commitment. Tragically Chris died in a motorbike accident. He chaired the committee and writing in the 1984 programme thanked Paul Conroy, Peter Ferringo, Jean Jenkins, Ken Pollard, Ted Corbett, Rene Gerity, Edna Abbott, Edith Wright, Tim Saddington and George Smith for their efforts. There was also mention for Terry King of the Parks Department and Bill Lake, head park keeper of Royal Victoria Gardens. “The day of fun means so much to people of our area and so many people helped to make it a success,” Chris wrote. I know from speaking to people so many years later, how much they thought of Chris and his wife for the joy they gave to the community. Local industry and commerce also played their part. By no means a comprehensive list, but among those regularly mentioned were The LDDC, Newham Council, Tate & Lyle, The Fire Service Benevolent Fun, PLA, St John’s Ambulance, Met Police K Division, WSB, Kennard Street Community Centre, Silvertown firefighters, the Royal British Legion, Gulf Oil, Stratford Reference Library (as it was then), the Newham Recorder, all the primary schools in the area, St John’s Church and Centre, T Cribb and Sons, Moffatts Printers and Pains Fireworks. There were great raffle prizes to be won as well. One year, the local police hired the Woolwich Ferry for an evening riverboat disco up to Tower Bridge. I don’t think anything like that has happened since. It was truly wonderful, though I really don’t remember too much about it, as some alcohol may have been taken. Locals say the enthusiasm never waned but Health and Safety regulations meant £1,000 had to be paid to for park and other insurance and other costs rocketed. Barriers had to be put up around the roads – and sadly the festival was no more. For years people have talked in glowing terms about the stories of the festival, and social media groups have led to those stories being repeated online – and the posting of pictures has helped keep this Forgotten Story very much alive. Now, those who have lived in the community for many years are being joined by newcomers who are making a real commitment to the area. It is building slowly but surely. A history group has been formed, St John’s community centre is flourishing again, the Royal Docks Community Voice group is thriving. The Tate Institute is flourishing, clean-up campaigns and litter patrols are working. There’s a major competition to design probably the biggest mural in the country on the ‘Berlin Wall’ that hides the Crossrail project. Now Ferry Festival: Past, Present and Future has been formed and a summer festival of music, food, art, sports and heritage is being organised, with a Festival Day on September 23. All the latest news can be found on the Facebook page.